Disney World is known for being a magical place, but sometimes their guests make a little magic of their own. 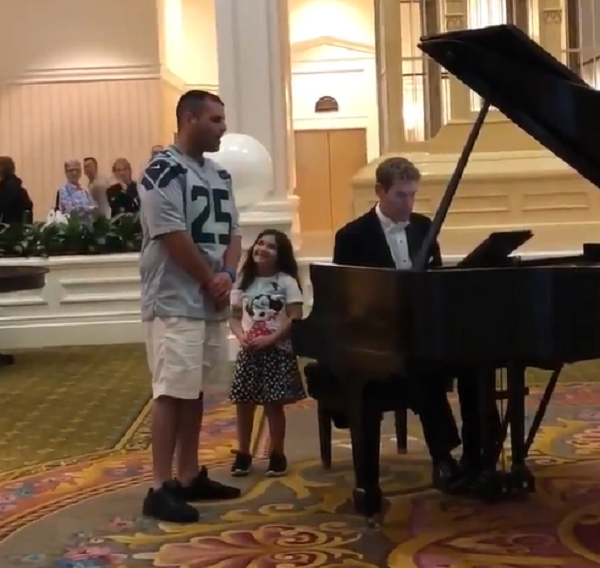 While on vacation at the Grand Floridian Resort in Orlando, Florida, Justin Gigliello and his family were heading to lunch when they spotted a tuxedo-clad pianist playing a baby grand piano in the posh hotel lobby. 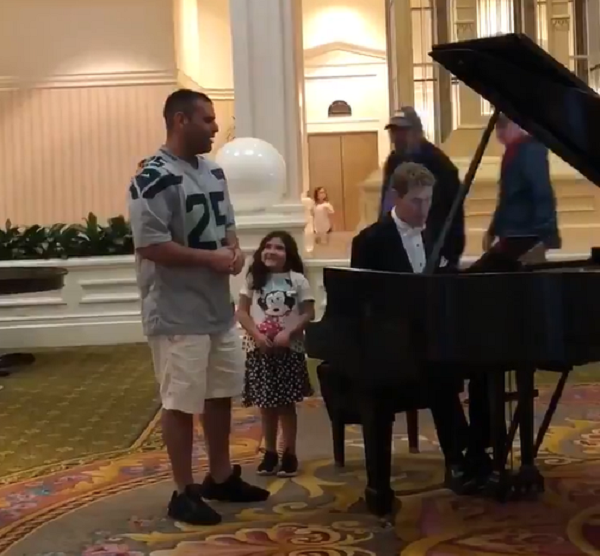 Justin and his 6-year-old daughter Lyla began to dance to the music, and when the pianist finished his song the little girl shyly approached him with a request. Justin was being modest when he told the pianist that he sings. As it turns out, he’s a classically trained opera singer who graduated from the Boston Conservatory with a degree in voice performance. 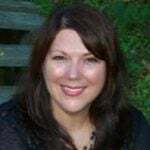 Back home in Connecticut, he runs an underwriting business with his wife Lauren while teaching piano and voice lessons. He also somehow finds the time to help save lives as a member of the North Stonington Volunteer Fire Department. Today, however, Justin was on dad duty. Dressed casually in shorts and a T-shirt, no one could have known what to expect when he stepped up to the piano and began to sing. As the first stirring strains of “Ave Maria” filled the lobby, onlookers were stunned by the beautiful operatic voice that resonated throughout the room. A small crowd began to form and soon, people had pulled out their cell phones to record a bit of the magic they were seeing before their very eyes. Standing next to Justin was Lyla, his biggest fan, gazing adoringly at her dad. Anyone can see just from looking at her that she is proud as punch that her dad is so talented! In fact, after Justin uploaded the clip to Twitter it was Lyla’s adoring gaze that garnered the biggest response. 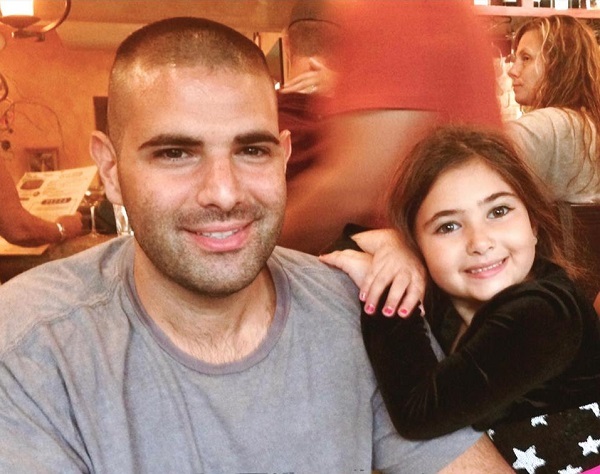 Lyla’s mom says that there’s no doubt that Lyla is her father’s biggest fan. The two often sing together around the house, and Justin sings to Lyla before she goes to sleep every night. “As soon as I wake up, if I don’t hear him, I’ll hear her,” said Lauren. 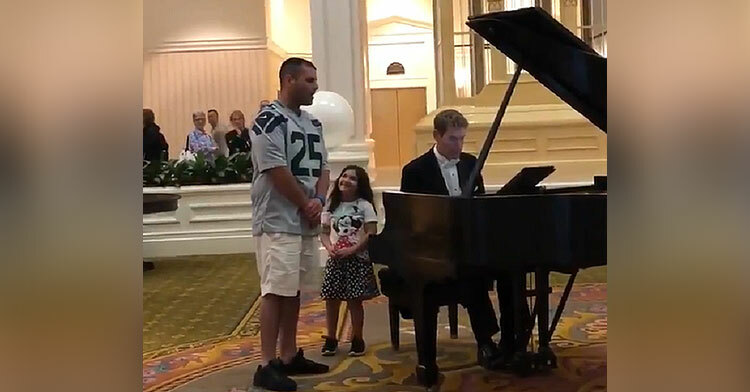 “We just went to Disney World last week and my daughter asked the pianist at the Grand Floridian if I could sing while he played. This is me singing Ave Maria. I hope you enjoy!” Justin wrote on Twitter. Before long the clip had taken off, and Justin couldn’t be more pleased with the joy his voice has brought to thousands. 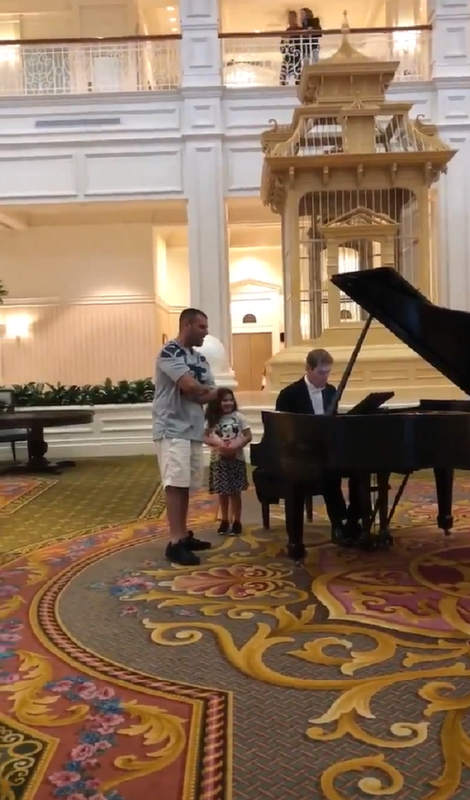 He says that when he was growing up, his family would often come to the Grand Floridian to listen to the music, so having this incredible moment go viral is full-circle for the proud father. “We used to stay at the Polynesian right next door and we used to go over for the music,” he said. “Now I’m here with my daughter and I’m singing. It’s beyond what I ever could have dreamed,” Justin added. Lyla agreed and now she, too, has dreams of becoming a singer. With training from her internet-famous dad, we have no doubt she’ll be wowing us herself someday! It just goes to show that you just never know what might happen when you’re in the most magical place on earth! 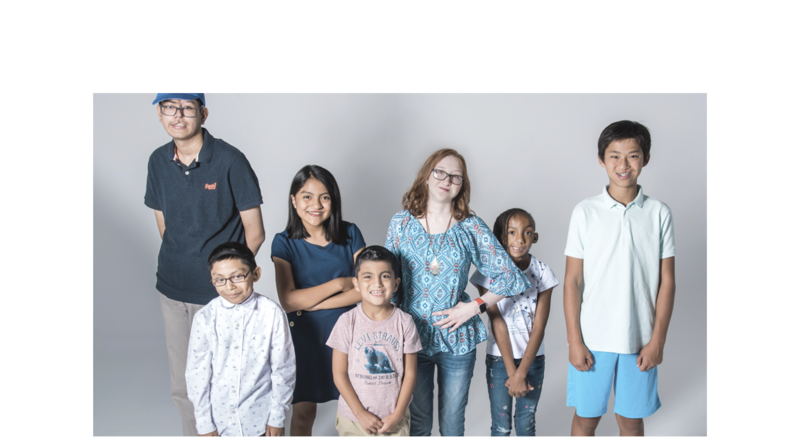 Check out Justin and Lyla in the video below, and be sure to share this beautiful musical performance with others.